In a little less than 100 years the transition from the plump, cumbersome archetype to the present noble appearance has taken place. The breed’s particular assets are a far reaching nose, impressive, firm pointing, willingness to track down, retrieving, following blood scent, toughness, endurance and passion for water hunting. All of these attributes are absolutely set in stone by the breeders. The breeders of our versatile hunting dog have made an enormous contribution to today’s appearance of the Deutsch-Kurzhaar through close observation of the hunting specifications as well as their knowledge and experience. They were supported by the founders and the club presidents in their efforts to achieve the best possible results. With diligence and German thoroughness they jointly helped the Deutsch-Kurzhaar acquire today’s significance. In Germany the Deutsch-Kurzhaar is the most common versatile hunting dog next to the Deutsch-Drahthaar. A downright enthusiastic upward trend can be observed not only in Europe, but far beyond the borders of Germany. The DK thrives on its growing popularity on all continents. The yearly test statistics in the German Versatile Dog Registry of the JGHV e.V. clearly substantiate that the DK achieves excellent results in comparison to all other pointing breeds. In relation to the registered whelps the Deutsch-Kurzhaar almost always is at the peak of accomplishment with its wide-ranged performance spectrum. Through literary sources we know that the ancestors of the Deutsch-Kurzhaar can not exclusively be found among the Old German lead dogs, bloodhounds, scent hounds, hunting dogs and further native breeds. These dogs were specialized in attacking and bringing game to bay The history of the Deutsch-Kurzhaar begins with the dogs that were used to point birds in order net them – especially in the Mediterranean countries and by falconry hunting. The pointing dog came to the German courts via France, Spain and Flanders. These dog’s most important attribute was their pointing capability. After the double-barrelled shotgun was invented in 1750 there was an even greater need for a pointing dog. As of then, birds were shot in flight. Due to Napoleon’s conquest over the feudal system the hunting of small game became accessible for various social levels. That was the beginning of the transition from the mere pointer to the multi-talented all purpose gundog. Hektor I (Stammb. Kurzhaar, Volume I, born 1872) may be referred to as the ancestor of our Deutsch-Kurzhaar, although his type was far away from today’s Kurzhaar. For the most part, they were heavier, often had throat skin or a sway back, ectropion or soft paws. As a result they were slower and calmer workers, but they were already highly efficient and most of them were good retrievers. In relatively short time our DK-breeders have formed the type of our present dogs out of Hektor I. The standards, as described in the Standard Deutsch-Kurzhaar, have been achieved in all blood lines. The over-all appearance is noble and harmonious, the exterior guarantees endurance, power and speed. This expresses itself through the noblesse of the over-all appearance, the flowing side lines, dry head, well carried tail and the taut, shining coat. DK-breeders offer hunters the Deutsch-Kurzhaar under the motto: noble, versatile, reliable, easy to groom. The Brown-Tigered-Club that war founded in 1880 and already changed the club name to "Kurzhaar Berlin" in 1891. 34 Deutsch-Kurzhaar clubs in Germany and one club each in the USA, Canada and Belgium have emerged out of the original first club "Kurzhaar Berlin". One foreign club, Switzerland, is an associated members. The Deutsch-Kurzhaar-Verband has an alliance with 29 further countries which are members in the World Union Deutsch-Kurzhaar, founded in 1991. The clubs in the Deutsch-Kurzhaar-Verband e. V. have more than 6,400 members. The Deutsch-Kurzhaar-Verband e. V. is a member of the JGHV (Jagdgebrauchshundverband e. V.) and the VDH (Verband für das Deutsche Hundewesen und participates in the tests. 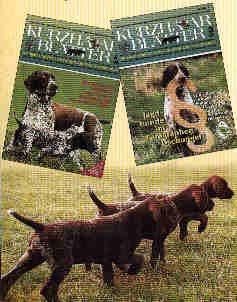 The Deutsch-Kurzhaar-Verband e. V. is the second largest versatile hunting dog breeding organisation in Germany. About 1,400 whelps are registered each year in the stud book DK. 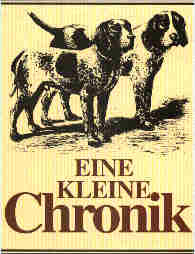 The "Zuchtbuch-Deutsch-Kurzhaar", which has been published since 1897, is the ultimate reference about the structure and the development of the breed. The Deutsch-Kurzhaar-Verband e. V. has been working with electronic data processing for many years. Each pedigree includes five parental generations including all of their acquired test and show results. All members get the official publication "Kurzhaar-Blätter" quarterly free of charge. Our ancestors wanted to breed and develop a dog to fulfil versatile hunting requirements. The market continually requested an "improved" dog which gradually lead to the improved type and performance-related exterior. The validity of the thesis is confirmed by the fact that other hunting dog breeds have crossed in Deutsch-Kurzhaar. The reason for that was to promote the performance range, and to embed assertiveness, character, elegance, excellent pointing manners, water passion and a keen nose. The Deutsch-Kurzhaar is popular in all colours from solid-coloured brown to brown ticked and black ticked and even solid-coloured black as well as all combinations in between. The short, thick hair is easy to groom. The house and car are soiled less than by a long-haired dog. The dog is dry faster after working in the water. The "Standard Deutsch-Kurzhaar" describes the ideal versatile hunting dog. That enables him to fulfil the hunting requirements up to an old age. The responsible people in our umbrella organisation, the presidents and breed wardens of the member clubs have mission to maintain and improve the high standard in performance and conformation and to cultivate the characteristics that emphasize the advantages of Deutsch-Kurzhaar compared to other breeds. The breeder’s goal of a versatile hunting dog whose performance for work after the shot is at least as good as of all other versatile hunting dog breeds, but whose work before the shot (excellent search, impressive pointing and fine manners in front of game) exalts him, has been reached to a great extent.